Is sexting a sign of early sexual activity? Posted September 30, 2010 under Ask the Mediatrician. Q: I thought I had a handle on my 15 year old’s texting habits, but I recently found some sexually explicit texts between him and a 12 year-old friend. Are my son and his friend more likely to jump into sexual activity, since they have been so daring in their texts? Can reducing screen time help kids with attention disorders? Posted September 21, 2010 under Ask the Mediatrician. Q: We have taken away screen media from our son’s daily routine and it seems to be helping with his hyperactivity. Do you think we should continue with this? Posted September 20, 2010 under Ask the Mediatrician. Q: Why should my family participate in Turnoff Week? A: TV, video games, and computers have become so common that, for many families, they are a default activity, rather than a choice they make about how they want to spend their time. It is not just cramming facts into children’s brains, but giving them the unstructured “down time” to process those facts and come to their own conclusions, that will give them the richest environment in which to develop. 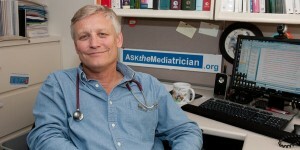 Posted September 14, 2010 under Ask the Mediatrician. What kinds of kids’ activities should be available in a waiting room? Posted September 7, 2010 under Ask the Mediatrician. Q: We are opening a new children’s center at our hospital. What kind of recreational technology would you recommend we put in our waiting room?